Ask most people to name some things about our first president and chances are you’ll hear about cherry trees and wooden teeth. So it would probably surprise those people that neither stories are actually true. George Washington likely never cut down his dad’s cherry tree as a child (the story in which he famously said to his father “I cannot tell a lie”), and he most certainly did not have wooden teeth, even though he did have some serious teeth and gum issues, his dentures were mostly made up of a combination of hippopotamus ivory, human teeth, brass screws, lead, and gold metal wire (but never wood). Washington’s dental difficulties were a nagging problem for most of his life. He lost his first adult tooth in his 20’s, and he only had one good tooth left by his inauguration in 1789. You could say his teeth-related concerns were a product of the times, and you would have a decent point, but it’s also important to note that among the elderly oral health is a huge problem still. 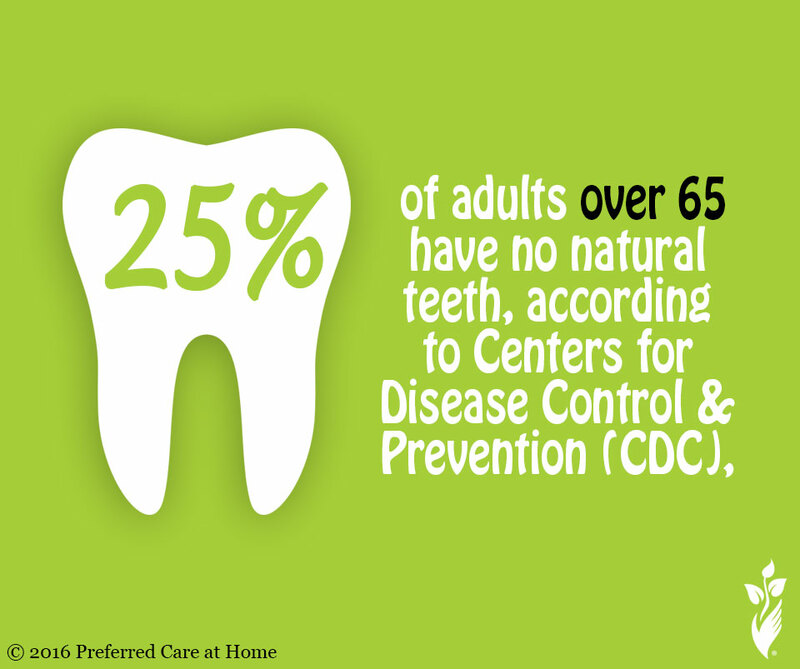 According to the Centers for Disease Control and Prevention (CDC), 25 percent of adults over 65 have no natural teeth. Good oral health is seen to be linked to good health in general, and bad oral health has been linked to a wide range of diseases prevalent in senior citizens, such as cardio vascular disease and osteoporosis. Avoid tobacco. In addition to the general health risks posed by tobacco use, smokers have seven times the risk of developing periodontal disease compared to non-smokers. Tobacco used in any form—cigarettes, cigars, pipes, and smokeless (spit) tobacco—increases the risk for periodontal disease, oral and throat cancers, and oral fungal infection (candidiasis). Spit tobacco containing sugar also increases the risk of cavities in teeth. If medications produce a dry mouth, ask your doctor if there are other drugs that can be substituted. If dry mouth cannot be avoided, drink plenty of water, chew sugarless gum, and avoid tobacco and alcohol. Practicing good oral hygiene should be a priority for your aging loved one, if it’s not already. Keep your teeth well-kept and they’ll be with you till the end (knock on wood).